Missing audio file problem sorted. Thanks to the good folks at Libsyn for helping resolve that one. If you’ve not heard the whole of show 296. Give it a good listen now. There really is some cracking music onboard. Still hanging on to the great vibe and even better music that characterised this year’s CMJ Music Maratjon and Film Festival. This week music from across the world, brought together for one week only in New York City. We’ve some old friends and some new discoveries but gems every one. 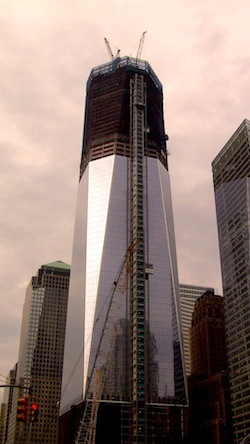 The new World Trade Centre buildings are shooting up at an impressive pace. I expect they will become as important points of reference to New Yorkers as the original towers became in their 30 year life. I mentioned last week that I’d have a track for you to illustrate the range in Grace Woodroofe’s music. This is an intriguing and enticing combination of almost introspective close up singing and out and out rock. From her current album Always Want. Multi-instrumentalist and stunning vocalist. Half-French and half-American, Wayser grew up in LA but spent a few months every year in Paris. She gleaned much of French culture from her songwriter father, leading her to musical influences that include Edith Piaf, Charlotte Gainsbourg, and Jacques Brel, among many others. This European sensibility is evident on both albums The Silent Parade and The Colorful, each filled with tunes that could easily provide a soundtrack to a Godard film or a playful scene from Jeunet’s Amélie. This track is from Sydney’s earlier album Silent Parade. The tone of the album makes an interesting comparison with the more recent release The Colorful from which I played a track a few of weeks ago in show 292. The title of this track translates as The wound and the knife. It is from Marc’s most recent EP One Hand on The Night. Look Mexico is a rock band from Tallahassee, Florida, now residing in Austin, Texas. The band is composed of Matt Agrella, Ryan Slate, Ryan Smith and Nick Chambers. Since their inception in 2004, Look Mexico have released two full length albums and three EPs, touring extensively in their support. Another track for you from Will Knox to round off this second CMJ retrospective. With a bit of perspective on CMJ, I really do think that Will’s show at The Rockwood was the standout performance of the week. It is from his digital album Lexicon which was recorded at Flux Studios and engineered by the very talented Meredith McCandless.